Looking for Alice in Wonderland Party ideas? 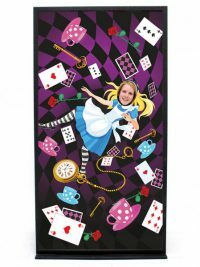 Our Alice in Wonderland Decorations & themed prop hire party section contains Alice in Wonderland props to hire suitable for any Alice in Wonderland Party. We’ve got great event theming party supplies for your event, including giant white rabbits, giant cupcakes and fantastic table centre! Be sure to also check out our new Vintage Ideas Theme! Life-size 3D Alice Character to hire. 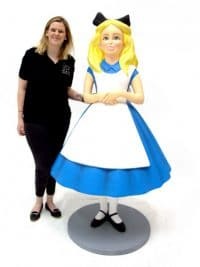 This freestanding prop of Alice is perfect for any Alice in Wonderland themed event and would make a fab photo opportunity for your guests. Why not position alongside some of our other Alice in Wonderland characters (pictured below); we've plenty of fab options to choose from. Do you want a jaw dropping entranceway to your event? If so, have a look at this fantastic offering from our amazing production team. This prop is big and bold and will help to set your event apart from the rest. 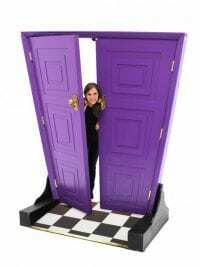 Perfect for Alice in wonderland, Willy Wonka, Circus themed event, or any entrance where you want an unusual & striking doorway! This freestanding feature prop can either be a working entranceway or a piece of background theming. This prop will arrive flat packed and take 2 people approximately 15 mins to set up. Elements of the prop are heavy so make sure your helpers have had their Weetabix. The doorway comes complete with a large wooden effect step. Alternatively why don't you sit back and relax and let us do all the hard work….give us a call and discuss our installation options for this or any of our other incredible items. Giant White Rabbit with Trumpet available to hire! 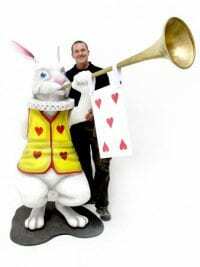 Greet your guests in the style of the Queen of Hearts with our Trumpet bearing Giant White Rabbit! Perfect for any Alice in Wonderland themed event. take a look at the rest of our Alice in Wonderland theme! 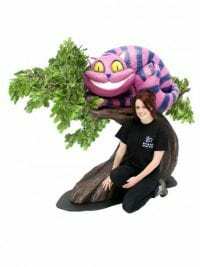 Grin like a Cheshire Cat at you event with this incredible Cheshire Cat Prop to hire. The icing on the cake at any Alice in Wonderland event! This prop is fully 3d. 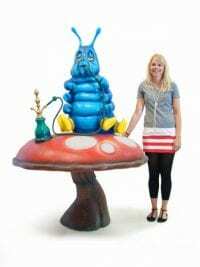 Giant 3d Smoking Caterpillar on Toadstool Mushroom prop to hire. This prop to hire is perfect for any Alice in Wonderland tea party themed event. Why not hire along with our Giant 3d Rabbit and Giant 3d Cheshire Cat! Giant Alice in Wonderland Crockery Stack to hire. A giant version of our popular Crockery Stack Table Centre, this prop is perfect prop hire for any Alice in Wonderland themed party. Prop is freestanding and fully 3d. 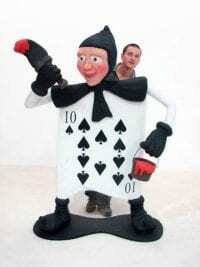 3d Card Man Alice in Wonderland Prop to hire. 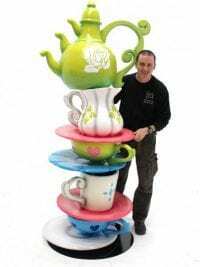 This freestanding prop to hire is full of character and detail and is perfect prop hire for any Alice in Wonderland Tea party event. Why not hire a pair for an entranceway to greet your guests? Price quoted is for the hire of one only. A fantastic Giant Rose Topiary Bush to fit in with your Alice in Wonderland theme. This is a great prop that would add character to your event and would look fab alongside our Giant 3D Card Man, who comes complete with a pot of red paint (prop only) ready to finish painting the roses red! Check out our fabulous topiary montage opposite; all items available to hire separately. Giant Pink Flamingo Bird Prop to hire. 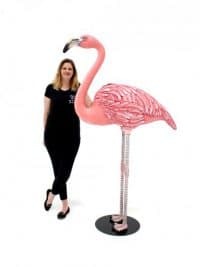 This giant Flamingo is perfect for any Alice in Wonderland, African or Animal themed event; providing a real talking point for your guests. Why not try a pair either side of your entrance or bar to create a real impact?! 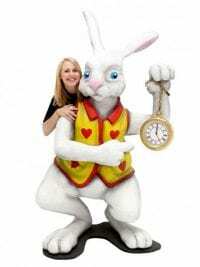 Don't be late for your event with this Giant 3D Alice in Wonderland White Rabbit to hire. Perfect for any Alice in Wonderland or Easter themed party or event! 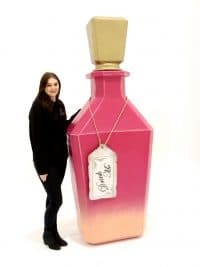 Giant 3d Alice in Wonderland drink me bottle prop to hire. This bottle is freestanding and can even double up as a perfume bottle making it perfect prop hire for any Alice in Wonderland Tea Party themed event! 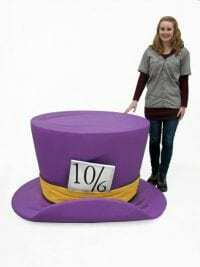 Giant 3D Alice in Wonderland Mad Hatter's Hat available to hire! This oversized version of the Mad Hatter's famous Hat would make a great addition to any Alice in Wonderland themed event! Finished in an eye catching purple, this prop would stand out any themed party. Take a look at the rest of our Alice in Wonderland themed props, they'd look great alongside this Hat! 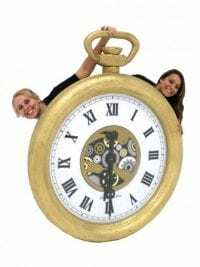 Oversized 3D Pocket Watch to hire. Finished in gold, this prop would be perfect for our Alice in Wonderland themed event or tea party! Prefer it in silver? Just click here then! 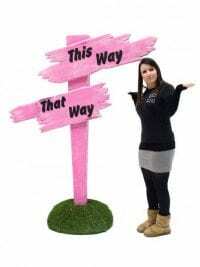 From the Topsy Turvy world of Alice in Wonderland why not hire our This Way That Way Sign to complete your event. Up Down Sign to hire. 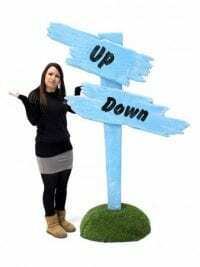 Our Up Down Sign will really enhance your Alice in Wonderland theme and put the finishing touch to your event. And to complete the set why not hire our This Way That Way sign (ALC83)? 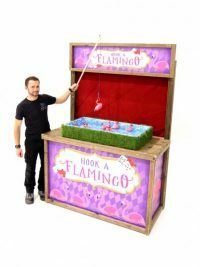 Hook a Flamingo Fairground Game for hire. Roll up roll up! 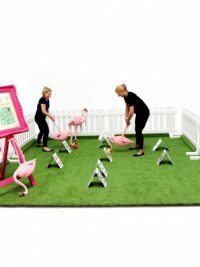 Test your ‘fishing’ skills with our beautiful non-traditional Hook a Flamingo Fairground Game. Try to hook as many flamingos as you can with the supplied ‘fishing’ poles. This would be fabulous for any Alice in Wonderland themed event! Giant Ornate Gold Frame Entranceway for hire. Welcome your guests in style with our giant ornate gold frame entranceway. It is a lovely freestanding, elaborate prop that will look great as an entranceway for many different themes. 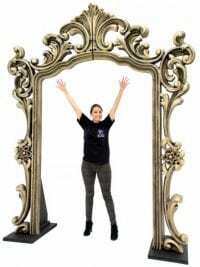 So, whether your party or event is themed as Alice in Wonderland, English Country Garden or Fairytale, to name but a few, this ornate gold mirror entranceway will look great! Mad Hatter's Table Centre to hire. 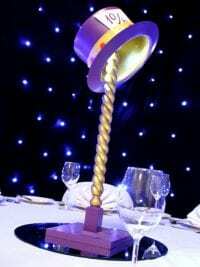 Take a look at this fun table centre styled around the mad hatter's hat. This would be absolutely perfect for your Alice in Wonderland event or Mad Hatter's Tea Party. Please note that the hats are fixed into position on their stand and so not wearable and that the hire price is for the mad hatter's table centre only. The mirrored disc is available to hire separately..
Mushroom Table Centre to hire. 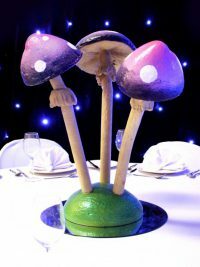 This fully 3D table Alice in Wonderland styled table centre features three purple & pink airbrushed mushrooms finished in a subtle purple glitter. Sitting on a grass-effect painted base, this table centre would be the perfect prop to hire for any Alice in Wonderland Tea Party event, or perhaps a Willy Wonka themed event or party! Please note that the hire price is for the mushroom table centre only and that the mirrored disc is available to hire separately. 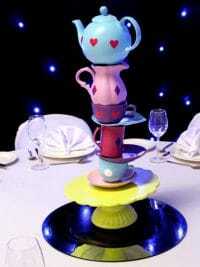 Stacked Crockery Alice in Wonderland style Table Centre to hire. Finished in vivid pink, blue & purple, this table centre comprises of a teapot, cups & saucers 'precariously' stacked upon one another. Made from expanding foam & secured in place, there is no need to worry about them toppling over & breaking! Hire these and you will add a really fun element to your party or event. Please note that the hire price is for the stacked crockery table centre only and that the mirrored disc is available to hire separately. 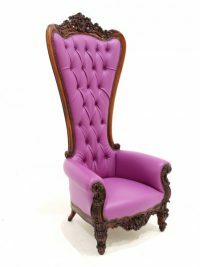 Giant Purple Dining Chair for hire. Alice in Wonderland Peep Thru Board to hire. This peep thru board capture the madcap world of Alice in Wonderland and offers the perfect picture opportunity for your Alice in Wonderland themed event for your guests. Alice in Wonderland Walkway to hire. Welcome your guests in style with our Alice in Wonderland themed walkway! 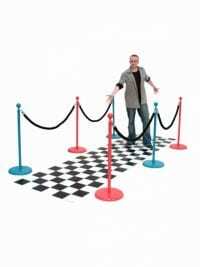 This walkway consists of one 5m black and white checked vinyl walkway, with three pink and three blue stanchions and black rope sections. Alice in Wonderland Welcome Sign to hire. 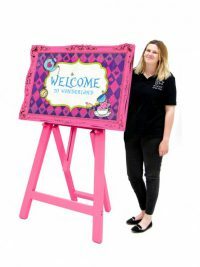 This brightly coloured frame and easel with an Alice themed Welcome to Wonderland insert would create a fantastic first impression for guests entering your Alice in Wonderland themed event or party. We also have a similarly themed VIP Entrance sign (below). Giant Heart Motif Prop to hire. 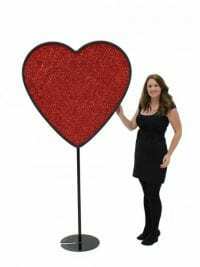 This giant 3D heart motif with a quality red glitter finish, along with our other giant card motif props (see below), is the perfect prop to hire for your Alice in Wonderland, Secret Agent or Casino themed event or party. Please note that this prop differs slightly from the picture, in that the base now consists of a pole and a solid black box (roughly 39cm square) for stability. 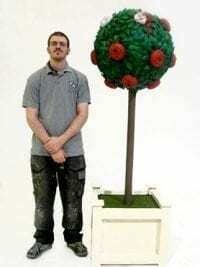 Replica Topiary Tree Twist Bush to hire. Multi-coloured spiral artificial topiary tree, suitable for any themed event or party night where you want bright colours. 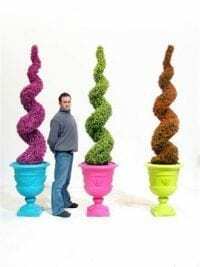 So if you want a crazy Alice in Wonderland theme party or Willy Wonka themed event or party, these crazy coloured artificial topiary trees will really make a difference! Please note that the price quoted is for one tree. We cannot guarantee the colour, we have a number of different colour combinations in stock. 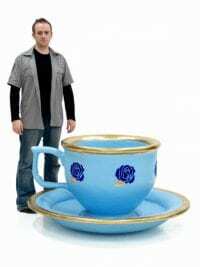 Giant China Teacup and saucer set to hire. Perfect for any Mad Hatter's Party or Alice in Wonderland party theming or perhaps even a special little princess' birthday? Why not hire our other two designs as well? Note: This is a fibreglass prop and is a china styled cup, not real china! Hot Pink Chesterfield Bar for hire. 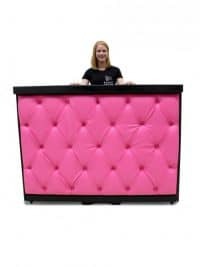 This hot pink Chesterfield bar is upholstered with a pink leather effect vinyl and would be a great item for any Alice in Wonderland themed event or party. The price quoted is for a 1.5m bar but but we can also supply this as a 3m and 4.5m length bar too (see pictures opposite). Please note that the price quoted here is for one section of bar (although several sections can be placed together to form a longer bar), as pictured opposite. The sides, front and top of the bar will be delivered separately to the bar framework for you to assemble on site yourself. 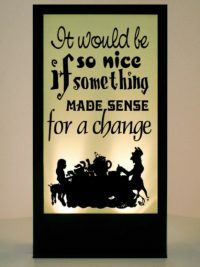 Alice in Wonderland Silhouette panel with iconic "It would be so nice if everything made sense for a change" text from the story. The perfect prop to hire for any Alice In Wonderland themed tea party! All Parcan lights have a 1m lead and it is the responsibility of the client to provide extension leads if longer leads are required. Price quoted includes one supplied light. 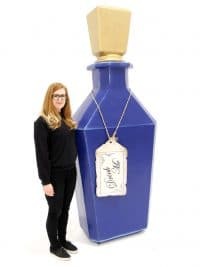 Giant Alice in Wonderland Drink Me Potion prop to hire. 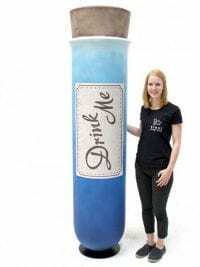 Perfect for any Alice in Wonderland themed event or party, this giant drink me potion tube is freestanding and has a lovely blue finish and painted cork-effect stopper. This drink me potion is just one of a number of giant Alice themed bottle we stock; check out the others below. High Back Chair for hire. This is a beautiful vintage style high back chair that has been given a modern twist with the addition of a vibrant leatherette. 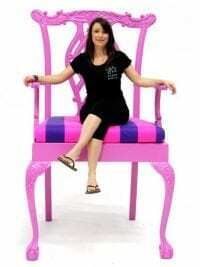 We can see this item, along with the other pieces in thjis range (see below), looking fabulous across many different themes, particularly in an Alice in Wonderland themed event. 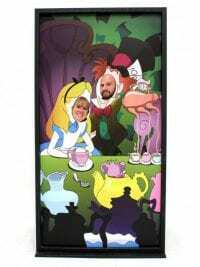 This peep thru board with iconic image of the Mad Hatter & Alice would offer a perfect picture opportunity at your Alice in Wonderland themed event for your guests. Think back to when you were a child. Think back to your Grandparents' dining room table stacked out with those lovely Sunday lunches…remember how you felt….. those were the days. Well, EPH is proud to give you the opportunity to hire for your themed event this stunning giant dining table. This is not simply some 2 x 2 timber bashed together….no, this is a high quality piece of furniture….only MASSIVE! This item would look amazing in an Alice themed event or at a Back to School themed event. And yes, you can sit on it….as long as you provide the ladders! 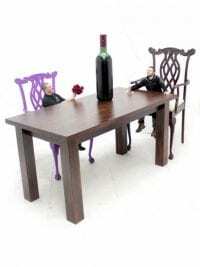 Please note that the price quoted is for the table only; the chair and accessories are available at extra cost.